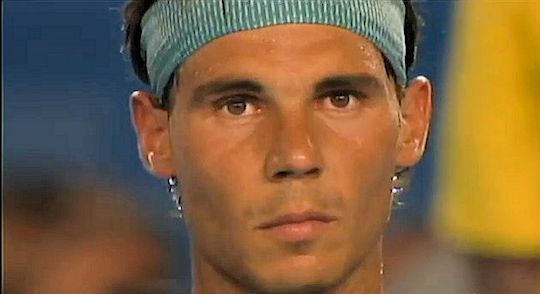 The Australian Open is underway and so far the conditions have not proved too problematical for Rafa. Some of us were concerned about his first round match since we have a morbid tendency to believe the hype around Bernard Tomic. 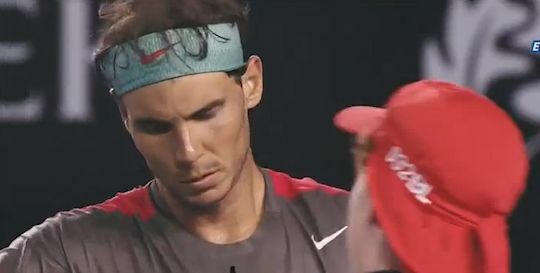 They'd only played once before and although Rafa had won in straight sets, it had not been a particularly easy match. In his pre-tournament press conference, Rafa was asked for his first thoughts about the match. He replied, "Well, good start (smiling). No, just is not the best round I know to start a Grand Slam, playing against a player who is local and who is young, who played great in the past here, and who is playing well because he's in the final of Sydney. So, is a tough start." Of course, it turned out not be tough in the slightest since Tomic tweaked a muscle in the first game. He took an extended injury break after the third game and carried on until retiring at the end of the first set which Rafa won, 6-4. I, for one, was not expecting his second round opponent to be Thanasi Kokkinakis since, on paper, Sijsling seemed more likely to come through that match. 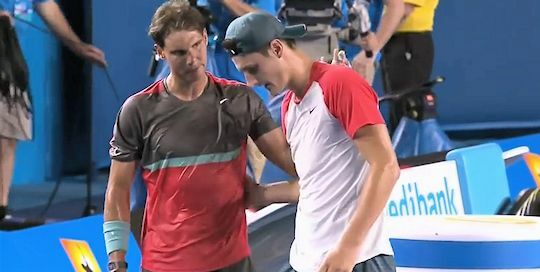 Before the tournament, Kokkinakis asked Rafa if he would be nervous. One suspects that Rafa was not exactly quaking in his shoes. Although they'd never played a competitive match before, they had practised together in the past. What was more likely to be an issue was the extreme temperature in Melbourne. 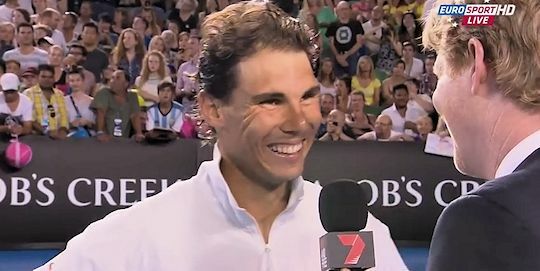 Rafa said afterwards that he was "very glad" that they closed the roof for the match. In the end it took just under 2 hours for Rafa to record a 6-2, 6-4, 6-2 win. As expected, Rafa's third round opponent was Gael Monfils. They'd had quite a tough match in the final of Doha and Monfils had been playing well this week so we were expecting a bit of a battle. Afterwards, Rafa reckoned it was his best match of the year. Can't argue with that since it took him a fraction over two hours to win, 6-1, 6-2, 6-3. Next week is going to be tougher. He plays Kei Nishikori on Monday for a place in the quarter finals.